Finland (The Republic of Finland) is a Nordic country situated in Northern Europe. The country covers an area of 338,145 km² and its population compromises of 5.24 million people. The official languages are Finnish and Swedish. Nearly all of the educational institutions are public, less than 0.8% are private. 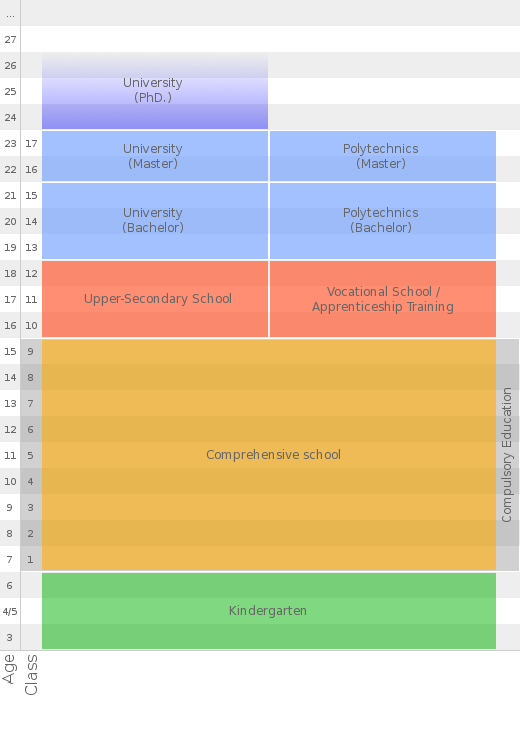 Keeping the size of the population in mind, Finland has quite a lot of schools. Please refer to the table below for figures on the amount of students per school. Language is an important factor in Finnish education. Please refer to the table below for figures on the language of instruction in Finnish schools. All children living permanently in Finland are legally obligated to complete the compulsory education syllabus. The syllabus can be completed by either participating in basic education or by acquiring a corresponding education through some other means. Therefore, there is no compulsory school attendance in Finland. Compulsory education starts during the year when the child turns seven years old, and ends when the basic education syllabus is completed or when ten years have elapsed from the start of compulsory education. The guardian of a child older than seven is responsible for ensuring that the pupil’s compulsory education is completed. Almost all children (99.7%) complete the basic education syllabus. Generally, compulsory education is provided in primary schools. Primary school comprises years 1-9 and is intended for the whole age group (7-16 years old). Minimum entrance age is 6 years, though the normal, recommended, age is 7. Pre-school education is intended for six-year-olds, who will start their compulsory education in the following year. Participation in pre-school education is voluntary, and it is provided in day care centres and in pre-school classes operating in connection with comprehensive schools. In 2000, a core curriculum was drawn up for pre-school education. The general principles set forth in the core curriculum also emphasise the child's individuality and the significance of active learning and functioning as a group member. The core curriculum does not divide instruction into subjects or lessons, but it does include various subject fields and objectives. These subject fields are: language and interaction, mathematics, ethics and philosophy, environmental and natural studies, health, physical and motor development and art and culture. Pre-school education does not have an official evaluation system, but children's development is keenly monitored. Special attention is paid to individual children's readiness for school attendance, i.e. the phase of their emotional, social and cognitive development. There are roughly 3700 schools. Almost all of these schools are public, 30 are private. Both public and private schools are funded by local authorities. The country does not oblige children to take any leaving exams during the last year of primary school. In Finland the national curriculum plays a key role within the educational process. All compulsory subjects and their contents are defined on a national level. On a local level, municipalities can add extra subjects to this list. Also, the country has a lot of primary schools of varying size. The smallest schools have less than ten students, while the largest have over 900. Upper secondary education consists of general upper secondary education and vocational upper secondary qualifications. General upper secondary education is general education that prepares students for the matriculation examination. The principal objective of vocational programmes is vocational competence. Education providers are free to organize the provision of studies and obliged to cooperate with other education providers in the region. Within the framework of the study programme or syllabus, students have the opportunity to choose study modules from another form of education. They are also entitled, on certain conditions, to have previous studies and studies completed elsewhere counted towards the general upper secondary school syllabus. Approximately 92 % of those who completed basic education in 2003 continued directly to general or vocational upper secondary school. Completion of upper secondary education is considered to be the minimum requirement for performance in working life and lifelong learning. There are 20 universities in Finland and 29 polytechnics. Of these 20 universities ten are multidisciplinary, three are technical, three are schools of economics and business administration and there are four artistic universities. All studying is free of charge. Entrance exams are not required; exams at the end of secondary education determine eligibility. Many programs are in place to monitor disabilities from an early age. Parents are given a lot of assistance in order to best care for their child. If special educational services are required they must first be looked into by the students’ own school. Many facilities are provided free of charge, upon request. If completion of primary school is not possible, the disabled student together with a teacher will make an individual education plan with his or her own goals. The proposed development of the Finnish education system is described in the government programme and is confirmed by the Government every four years in the Development Plan for Education and University Research. The objective of the development plan is to improve equitable and high-quality basic education. Schools and other educational institutions should feel secure in terms of the basic operational requirements and resources, and these should be targeted towards instruction and counselling. Special attention should be given to preventing the exclusion of children and young people with problems and providing them with adequate support. The Government is implementing an extensive Information Society Programme in all fields of administration. Finnish schools and educational institutions were equipped with computers and connected to information networks with the aid of increased state support in the 1990s. By and large, the technological objectives set earlier have already been achieved and the focus of development has shifted to content production, teacher training, and utilisation of information networks. Finland has been investing in the development of education in mathematics and natural sciences for several years. The level of learning is being raised through various means. One of the most significant means is developing teacher training and investing in teachers’ continuing and in-service training. An important goal in the development of education in mathematics and natural sciences is promoting industrial production based on natural sciences and high technology. Language teaching and internationalisation are another important target for development. Special investments and development projects aim to enhance students’ knowledge of foreign cultures and to diversify their choices in language studies. From an international perspective, Finns study many foreign languages, but their choices largely focus on a few major languages. International activities and mobility in education and research have been increased primarily through multilateral exchange programmes. Special attention has been given to eliminating barriers to mobility. Like most developed countries, Finland has built the basic infrastructure for education over past decades and is now in a situation where special emphasis must be given to the quality of education. One means of quality assurance is the evaluation of educational outcomes. In recent decades, decision-making powers have been delegated to the local level, thus making evaluation a significant tool for the governance of education. In legislation, evaluation duties have been assigned to both education providers and the authorities. Cooperation between education providers and employment providers is desirable because education needs to meet working life requirements better. Such cooperation is necessary because the education system is highly institution-oriented. Employer representatives participate in advisory bodies for vocational education, at both the central administration and local levels. Acquainting students with occupations, on-the-job learning or fixed-term studies at workplaces have become a regular part of studies leading to vocational upper secondary qualifications or polytechnic degrees. Students in basic and general upper secondary education can also include a period of work experience in their studies. University graduates’ employability is supported through guidance and counselling services and by increasing practical training and cooperation with trade and industry. Teachers are the most significant factor underpinning educational results. In recent years, teachers’ competence has been given a great deal of attention. At the end of 2001, the Ministry of Education published a teacher training development programme which provided recommendations for teacher training at universities and polytechnics as well as for teachers’ in-service training. The recommendations deal with matters such as selection of applicants, pedagogic studies, and the status of teacher training. The development programme also assesses teacher training needs up until 2010. Lifelong learning became a key issue in debates pertaining to educational policy in the 1990s. The ageing of the labour force, the growing number of people reaching retirement age, the growing differences in education between generations, and the increasing demand for higher occupational skills and competence have all posed new challenges for education. As a result, Finland is highly committed to making lifelong learning a reality.